This is no time to wallow in negativity. New brain science reveals why staying positive is your best defense against career stagnation. NEW YORK (Fortune) -- With widespread job cuts and a recession to deal with, it's not easy to maintain a positive outlook at work these days. But being upbeat, despite the stress, could actually help you thrive during a downturn. "Most people make the mistake of thinking that success leads to happiness. In fact, our brains work precisely the other way around," says Shawn Achor, head of Aspirant, a consulting firm that advises clients like Microsoft (MSFT, Fortune 500), American Express (AXP, Fortune 500), Credit Suisse (CS), and UBS (UBS) on how to keep morale and productivity up in these extraordinarily difficult times. A positive approach to the daily grind, he adds, "gives rise to resilience, energy, and the ability to influence other people -- all things that create success." So if you want to come through this downturn with flying colors -- and maybe even a promotion or a raise -- you need to think positive. Talkback: Are you happy at work now? What helps you stay positive? Leave your comments at the bottom of this story. Among them: "The two most important predictors of success are, first, whether we believe our behavior matters, that is, whether we think we can make a real difference -- and many people lose that belief in hard times, because so much is out of their control," Achor says. "And second, how do you manage stress? Does it paralyze you, or does it move you forward to action?" 1. Practice looking for the good. 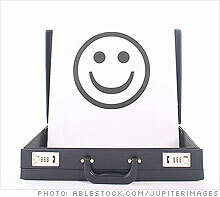 Achor cites studies showing that people who keep a daily "gratitude list" become happier and more successful over time. "For the next 21 days, every night before you go to sleep, think about three things you're grateful for. Say them out loud," Achor suggests. "If you try to make at least one of them work-related, you're training your brain to let go of the daily hassles and notice the good things about your job" - including, of course, having one in the first place. 2. Have some fun. "Many people think the words 'work' and 'fun' are mutually exclusive," Achor notes. But research shows that bursts of lightheartedness, whether from a smile shared with a colleague or a funny clip on YouTube, actually cause people to think more clearly and creatively. "It turns out that, when we're happy, our neurons fire faster and more efficiently," Achor says. Even when you're working flat-out, use something you enjoy - photos of your last vacation, or reading a blog you get a kick out of - as a reward along the way, he suggests. 3. Brighten your office space. Everything around you affects your frame of mind. "Certain environmental cues can trigger your reflexive brain into needless panic, while others can prime you for creative thinking or calm reflection," Achor notes. "The good news is that you have the power to control much of this input. Surround your desk with pictures and objects that lead you toward positive thoughts. Your mood and your brain will thank you." 4. Keep a journal. If you find yourself worrying about bad news, a scary rumor, or a stressful deadline, take three minutes to write down how you're feeling. "Neuroscientists have discovered that verbalizing negative thoughts can act like a wet blanket on a fire of negative emotions," Achor explains. "The simple act of putting emotions into words immediately decreases their magnitude." So dust off that old diary, or open up a Word document, and try it. Just make sure no one else sees it. 5. Invest in people. "Smart people do stupid things during times of stress, like shutting down their social networks to focus on work," Achor observes. "But in working with companies around the world, I've found that the greatest predictor of success during stress and challenge is the quality and quantity of your relationships." Decades of research have shown that close ties to family and friends are among the biggest contributors to happiness, and may even help people live longer. "Now more than ever, take the time to strengthen those connections in your life," urges Achor. "You can start small by reaching out to just one person a day." 6. Think of work as a series of sprints, not a marathon. You know what happens when you've been sitting at your desk too long: Your muscles tense up, your eyes glaze over, and your energy lags. What you may not realize, Achor says, is that after two hours of continuous work, your brain function actually slows and your body starts to rapidly accumulate stress and strain. "So try to split up your workday into short sprints of 90 to 120 minutes each, with a 5-minute break in between," Achor says. "Walk down the hall or around the block, call a friend, listen to a calming piece of music, do some stretching exercises, or eat a high-protein 100- to 200-calorie snack. Not only will you feel less run-down and worn out, but you'll see a jump in your concentration and productivity." Talkback: Readers, what do you say? Are you happy at work now? What helps you stay positive at work despite the current challenges? Sign on to Facebook below and tell us.